When my psychiatrist asked me to describe my mood, I told her it was a low, steady state of lethargy. The word "lethargy" didn't seem right, but I couldn't think of a more appropriate term. As we talked, she used the word "apathy." I exclaimed, "That's it! That's the word I was looking for! It's not lethargy, it's apathy." These two terms - along with "anhedonia," which means loss of interest in pleasurable activities - have some similarities in their meaning as used to describe symptoms of bipolar depressive episodes and clinical depression. What's interesting is their differences. Here's a look at each word. The root words of anhedonia are the prefix an-, meaning "without," and the Greek hedone, meaning "pleasure." Thus, it means being in a state where you don't enjoy things you usually like to do. In his normal mood, Michael loves to go to Los Angeles Dodgers baseball games. He even has season tickets. But during his last depressive episode, game days came and went, and Michael couldn't generate any enthusiasm for attending. Instead, he stayed home and didn't even watch the games on television. Anne loves to go shopping for clothes. When she's stable, she shops carefully, looking over and trying on many items to find the one piece that's perfect for her, whether it's shoes, a dress, a top, a pair of slacks - whatever she wants that day. When she's hypomanic, she often splurges, buying items willy-nilly because she likes how they look. She may come home from the mall with three dresses, six tops, three pairs of shoes and two pairs of pants, plus scarves and other accessories. When the credit card bills come in, she often has problems paying them because of her reckless spending. But when she goes into bipolar depression, all that changes. Just last weekend, in a normal mood, she went shopping alone, enjoyed herself thoroughly, and came home with a sharp dress to wear to work. This weekend, a friend calls to invite her to go to a mall with two other friends. They'll make a day of it, says the friend, shopping in the morning, having lunch together, then going to see a movie. But Anne isn't interested. She turns the invitation down and spends the day at home watching television and eating junk food. Candy is a social media freak. She spends hours on Facebook chatting with friends, posting her thoughts and updates, and linking to videos and memes. She reads everything her friends post and writes lots of comments. She plays interactive games. Then she goes into a depressive episode. She stops playing games and posts about how bad she feels. She doesn't much care about other people's updates and posts, and almost never comments on them. She stays offline from chat. She's lost almost all interest in something that gives her great pleasure in normal moods. The origin of this word is interesting. It comes from a form of the same prefix above, a- meaning "without," and the Greek pathos meaning "emotion, feeling, suffering." Thus, apathy was originally defined as freedom from suffering. Sometime in the 18th century, the meaning changed to a sense of being without emotion or feeling: indifference, especially to matters that are important or appealing. It is broader in scope than anhedonia. Lily has diabetes and needs to follow a careful diet to maintain her health. Normally she is conscientious about this and seldom has to look at the diet plan from her doctor and nutritionist because she has it pretty well memorized. But when depressive episodes come, she becomes indifferent about her diet. Instead of having a well-balanced breakfast, she'll eat a couple of slices of toast with peanut butter and honey. She'll often skip lunch and just have a hot dog or two for dinner. In between, she'll snack on candy bars or other sweet treats. John has been canvassing in his town for a candidate in a local election. He's thrown himself into it with energy and enthusiasm. An attractive and personable young man, he has been doing a good job, and snubs haven't bothered him – he knows that's all part of the effort. Not long before the election, his mood begins to spiral downward. He does less and less, sometimes visiting only 3 or 4 houses before quitting for the day. People are less responsive to him because of his obvious lack of commitment. What once seemed so important to him seems flat and uninteresting now. On election day, he doesn't even go to vote. Lethargy can be a state of body or mind or both. In both cases, the core component is slowness or sluggishness. 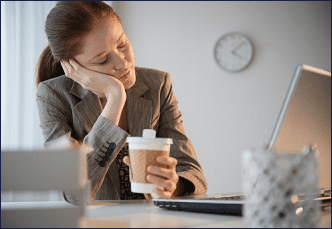 Being unusually drowsy or feeling numb mentally may also be defined as lethargy. Jane has three young children, one in first grade, one in Kindergarten, and one just a year old. While the two older children are in school (a full day for the first grader, a half day in the morning for the kindergartner), the youngest goes to daycare. Jane spends that time cleaning up after the kids, doing laundry, running errands, planning and cooking meals for later, etc. When she's depressed, most of these tasks remain undone. Some days she just goes back to bed. Other days she stays on the sofa. She may feel anxious about the dishes piling up in the sink or the laundry hamper overflowing, but she just doesn't have the energy to do anything about it. When she does attempt some housework, she feels so tired and sluggish that the simplest job seems like heavy labor. Aaron is normally a competent worker—not brilliant, but steady, responsible and careful. During depressive episodes, however, he often finishes assignments late. Errors creep in because he doesn't proofread his work – it's too tedious and takes too much concentration. Co-workers notice him staring at his computer screen blankly with his hands in his lap. It isn't that he doesn't care – it's just that his mind seems to be working too slowly to keep up with his work. Diane loves to go walking and hiking in the forested hills near her home. Almost every weekend she plans an outing, sometimes with friends or her hiking club, sometimes by herself. The fresh air, the scent of the trees, the exercise, all buoy up her spirits. Taking a new trail just to see where it goes always pleases her. When she becomes depressed, the walks and hikes cease. She's just too tired, or can't be bothered. She feels sluggish and dull (lethargy). The thought of walking just isn't appealing anymore (anhedonia). Then one weekend her hiking club galvanizes to help search in the forest for a missing child. In her normal state of mind, Diane would be at the forefront of the search, helping to organize and working tirelessly until the child was found. But today, she just doesn't even care about something most people consider critical (apathy). Someone else will find the kid, after all. She stays home, not even bothering to follow up on the search by phone.